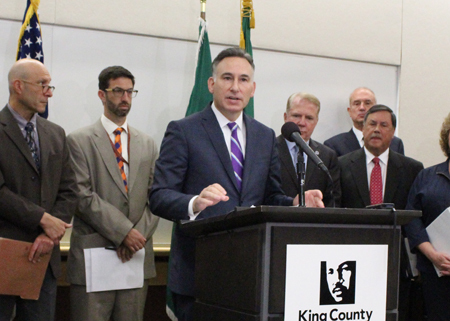 King County Executive Dow Constantine discusses the newly published report of a heroin and prescription opiate addiction task force at a press conference held Sept. 15. A county heroin and opioid addiction task force issued its recommendations Sept. 15 as to how King County and city officials should move ahead on dealing with drug abuse as a public health issue. Chief among the task force’s recommendations were a recommendation to increase the supply of overdose-reversing drug naloxone, as well as a recommendation to build two supervised injection sites in King County. But the eight recommendations in the task force's report also included provisions for addiction treatment and prevention, including disposal facilities for drugs and medications, and alleviation of barriers to treatment programs. “We can prevent people from experiencing this torment in the first place,” county Executive Dow Constantine said. The task force was formed in March by Constantine, with Seattle Mayor Ed Murray, Auburn Mayor Nancy Backus and Renton Mayor Denis Law, with the intention of bringing together experts from various fields to deliver strategies for handling an epidemic of opioid abuse. According to studies cited in the task force’s report, prescription opiates were the leading cause of overdose deaths in King County prior to 2013. Heroin surpassed prescription opiates as the overdose killer that year. Heroin deaths hit 156 in 2014, the highest in 17 years. A decrease in doctors prescribing prescription drugs from 2005 to 2010 indeed correlated with lower self-reported use of the same among high school students. However, 14 and 15 are now the peak ages at which heroin users report beginning their use of the drug. “Living life with heroin is not easy,” said task force member Thea Oliphant-Wells. A social worker for Public Health Seattle and King County, Oliphant-Wells struggled with ongoing heroin use until the mid-’00s. Access to harm reduction services opened the door -- and her mind -- to the counseling and help that let her get clean. Oliphant-Wells specifically pointed at supervised injection sites as a potential source for help for struggling addicts. The task force has named these sites Community Health Engagement Locations for individuals with substance abuse disorders, or CHEL sites. The task force did not specify where CHEL sites might be located, other than to recommend two such sites in areas of high substance abuse -- one within Seattle city limits and one without. Seattle Mayor Ed Murray said he would soon embark on a fact-finding mission in Vancouver, British Columbia to determine where that city has located its injection sites. The task force likewise did not estimate the cost of establishing the CHEL sites. “We don’t know the cost of any of it,” Constantine said, though he noted that the opioid epidemic had already incurred great financial and human cost. Looming large in the task force’s recommendations was a recommendation to reduce barriers and increase the availability of buprenorphine, an opioid that, much like methadone, is used for the cessation of heroin or prescription drug use. Unlike methadone, buprenorphine has a so-called “ceiling effect” in which its effects plateau and do not respond to greater dosages. County Sheriff John Urquhart applauded the potential for a shift to a focus on public health concerning the opioid epidemic.